Wallpaper Store Serving Norville – Largest Selection in MI! Wallpaper is back! More and more designers and homeowners are recognizing the advantages of decorating with wallpaper. Aesthetically, the huge variety of wallpaper colors, textures, and styles opens up amazing decorating opportunities that will give new life to any décor. Wallpaper adds warmth, depth, and character to your rooms. Even better, choosing wallpaper over paint is a sound economical decision. 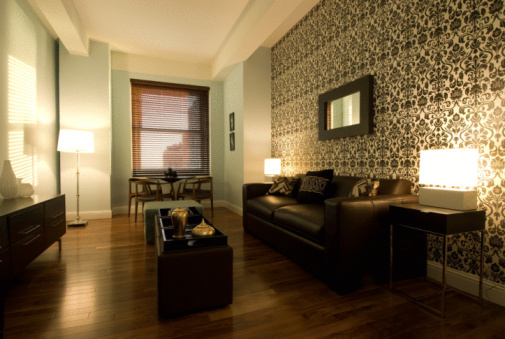 At Windows, Walls & More serving Northville and the surrounding areas, we offer the largest wallpaper selection in MI. Stop by our store to take a look! Applying wallpaper makes your wall stronger, and a wallpapered wall will last 8-12 years with little to no maintenance. You don’t have to worry about touching up or repainting with wallpapered walls. Today’s wallpaper is easy to remove, too, so there will be no hassle of removing your wallpaper if you decide to refresh your room in the future. Customers love our variety of textured wallpapers, especially hand-painted and faux fabric designs. The embroidered look is also very popular for its sophisticated and elegant look. Any textured wallpaper is going to add depth and character to your room, and it’s incredibly versatile. Textured wallpapers fit with most any décor, but work especially well in rustic, country, classic, or elegant rooms. The popularity of themes from nature has definitely made its way into the world of wallpaper. Natural inspirations such as leaves, foliage, berries, florals, rocks, wood grains, and the like are now popular on the walls of homes and businesses. These elements create a vibrant and lively feel in any room. Metallic looks are gaining in popularity, too, especially when integrated with natural styles, such as cork-like finishes with splashes of gold or silver. Also popular are animal prints, with wallpaper manufacturers taking their cues from the fashion industry. One of our wallpaper vendors, York Wallcoverings, has created a new variety to glitz and glam wallpaper by adding recycled glass beads and sandpaper to some of its wallpaper styles. These unique wallpaper options pick up light in an unexpected way, giving your room true sparkle. Glasscloth wallpapers with metallic strands weaved through them are also expected to be popular this year. Groovy is for walls, too! The retro look is popular in fashion and design industries, and wallpaper is no exception. Bright retro colors, circular patterns, florals, and paisleys with a feel from the 60s and 70s are coming back, often partnered with retro furniture styles. While some very nontraditional styles are making headway in wallpaper popularity, there are still a large variety of simpler wallpapers that provide just the perfect touch of elegance and warmth to any room. Using neutral colors, subtle patterns and delicate textures, basic wallpapers are comfortable and soothing. However you want to decorate your walls this year, we can help! Windows, Walls, & More offers the largest selection of wallpaper in Michigan. There’s no style we can’t help you find! Count on us for all your wallpaper, window treatment, and home design needs. Call or stop by today!